Striped frozen treats like this... well I can't help myself and if you've picked up the latest issue of Martha Stewart Living, then you've probably seen these. So if you're like me and love a refreshing icy treat that looks this good, then well... we're alike. I just knew that when I saw these little striped delights I had to make them soon... like tomorrow soon. 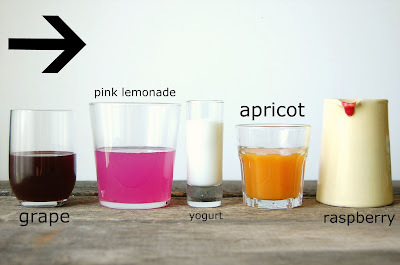 They are kind of a lengthy process with the freezing of each layer and what not, but they are well worth it and the flavor combinations are almost limitless and I have to say, right now I think the pink lemonade part is my favorite. I loved it's sourness. I don't really need to give you a recipe for this since it's pretty much just juices, puree's, and yogurt and you can add what ever you like. 1 cup greek or regular plain yogurt. 1/2 tsp vanilla bean paste or extract. Add the raspberries, sugar and wine/liqueur to a blender or food processor and blend until smooth. Pour through a sieve to remove the seeds. To make the stripes, pour a layer in each mould and let set at least 1 hour and repeat on the second layer and add your popsicle stick in each it should stay up-right. Repeat the layering and freeze overnight. I did mine off and on in one day and let freeze overnight. It might not take you this long, but my freezer seems to like to take forever for things to freeze throughly. So Healthy! 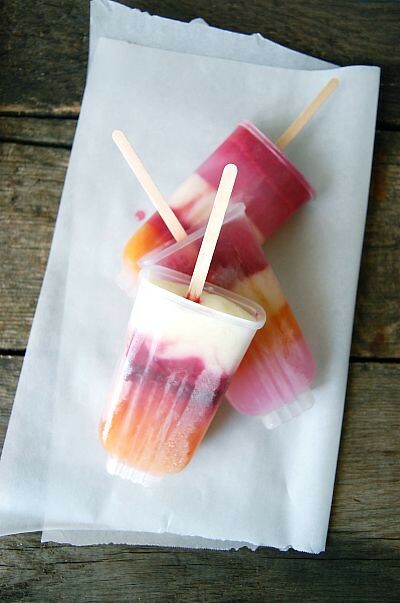 What a "chilling" idea for the summer :) I like that you get different fruity flavors in each bite! These are almost too pretty to lick! Beautiful colours. And I bet they taste amazing with Greek yogurt. Ummmmm could these be any cuter? LOVE THEM! (And want to eat one right now, despite it being only about 15 degrees outside). These are so pretty! Made me smile as soon as I saw your pictures and look utterly delicious. 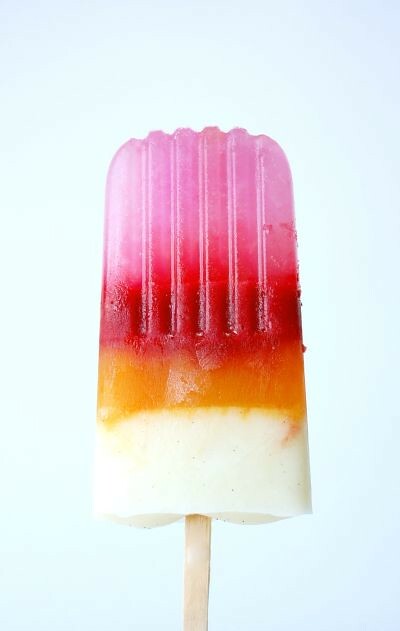 These are the most beautiful ice pop photos I've ever seen! These look delicious, I love the colors. Great photo! How fun! I haven't even had a chance to open my last issue of Martha, so I'm glad I saw these!! What lovely pops!! I love the different flavors you used. I hope all is well Ash,I heard about the quake! Beautiful and perfect for summer! Love the stripes. and i've been wondering how to make them! thanks for sharing! Ran across your blog over on Creature Comforts.... love this idea! 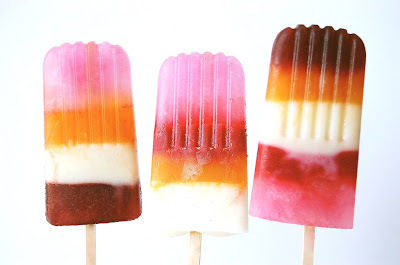 These popsicles are absolutely gorgeous. oh. my. goodness!!! need to make these stat!!! i don't know how no one asked this yet. but WHERE OH WHERE did you get the molds!!?? ps. Have you uses a Zoku popsicle maker before? You'll love it. I love me some popsicles. No, I haven't used a Zoku!! I must check this thing out!! Your pics are absolutely gorgeous! photography -- very appealing to the eye! What brand of ice pop molds are you using? They look great! They look beautiful and delicious! I would love to get some of those popsicle molds you have... where did you get them? I got these from Homesense. But they are by TOVOLO. Thanks for the link to the popsicle molds! Will have to get myself some. And thanks for visiting my blog too, even though its very neglected! What a great post! This reminds me of my childhood where we also made our own popsicles! These pops are absolutely beautiful. I totally need to try this! I love the layered look. Weird question, but I think we have the same popsicle molds; do you have any idea how far you should fill them when freezing? I've been over and undershooting the mark! just me my camera and sometimes mostly some food. I'm available for food styling and photography projects. *All writing and photography is copyright of butterflyfood, unless otherwise indicated. Copyright 2008-2018. All rights reserved.